The Colorado Army National Guard has nearly 3,500 men and women spread accross more than 30 units. The history of the Colorado National Guard begins in January, 1860, when the 1st General Assembly of the Jefferson Territory authorized the formation of two military companies - the "Jefferson Rangers" and the "Denver Guards". On February 26, 1861, Colorado became a territory of the Union and William Gilpin, the first Governor, organized the "Colorado Volunteers" for the defense of the territory and to oppose the invasion of Confederate forces during the Civil War, already under way. A force of mainly Texan Confederates fought it's way up through Sante Fe in hopes of procuring the rich Colorado gold mines to help fill the depleted Southern war coffers. The invasion force then planned to head west, form an alliance with the troops under Brigham Young in Utah and eventually take the western seaboard and all of California. The Confederates were intercepted and defeated by Colorado soldiers at La Glorietta Pass/Apache Canyon, New Mexico, on March 23-25, 1862. On December 16th, 1862, Colorado mustered its' first artillery unit, the 168th, into service. Two years later, the Colorado Militia was called to duty in the fall of 1864 to protect against the impending danger created by hostile Ute, Sioux, Cheyenne, Arapahoe, Kiowa, Comanche, and Apache Indians threatening settlers in the Colorado Territory. The state of Colorado served as host for the battle of Beecher Island (Yuma county) and the infamous Battle of Sand Creek (Kiowa county). The Colorado Guard was activated as the State Militia for the protection of public rights, safety, and property during the coal miner strike years between 1889 and 1922. The most publicized incidents occurred at Cripple Creek, Ludlow and Leadville. Again on April 27, 1898, the Colorado Guard was mobilized for service in the Spanish-American War and on June 14, 1898, sailed for the Philippines. 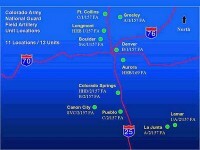 Colorado units participated in numerous battles and played a large role in the capture of Manila. It was on the battlefields of the Philippines that Colorado's only Medal of Honor recipient, Lt. Col. William R. Grove, fought bravely for his country. In the June of 1916, the Colorado Guard mobilized for Mexican Border service. They were stationed on the border until February of 1917. War was declared against Germany on April 6, 1917, and by the beginning of August nearly all units of the Colorado National Guard were called to federal service. The 1st Colorado Infantry was redesignated the 157th Infantry Regiment and attached to the 40th Division (National Guard) in California, and shipped overseas on July 29, 1918. The 168th Field Artillery Regiment was merged with the 148th Field Artillery of the 41st Division and arrived in France on February 8, 1918. On September 16, 1940, the 157th Regiment was mobilized for training and by February, 1941, all units in Colorado had been mobilized. The 157th, commanded by Major Felix Sparks (who later became the Ground Commander for Colorado and also a State Supreme Court Justice) was attached to the 45th Infantry "Thunderbird" Division. The 45th assaulted the beaches at Anzio, Italy, fought their way into Germany and eventually captured the infamous Nazi prisoner camp of Dachau. During WWII, Colorado units served with pride in both European and Pacific theatres. The 120th Observational Squadron furnished cadre for the Army and Air Force units. Following WWII, the Colorado Army and Air National Guard reorganized with the 120th Observation Squadron and became the nation's first Air National Guard unit of June 30, 1946. The Colorado National Guard was recalled for Federal service in 1950 for the Korean Conflict, 1961 during the Berlin Crisis, 1968 for service in Vietnam, and during the Persian Gulf in 1990-1991 during Operation Desert Shield/Storm (the 1157th Transportation Company of the Colorado Army National Guard was the first National Guard unit on the ground in Saudi Arabia). 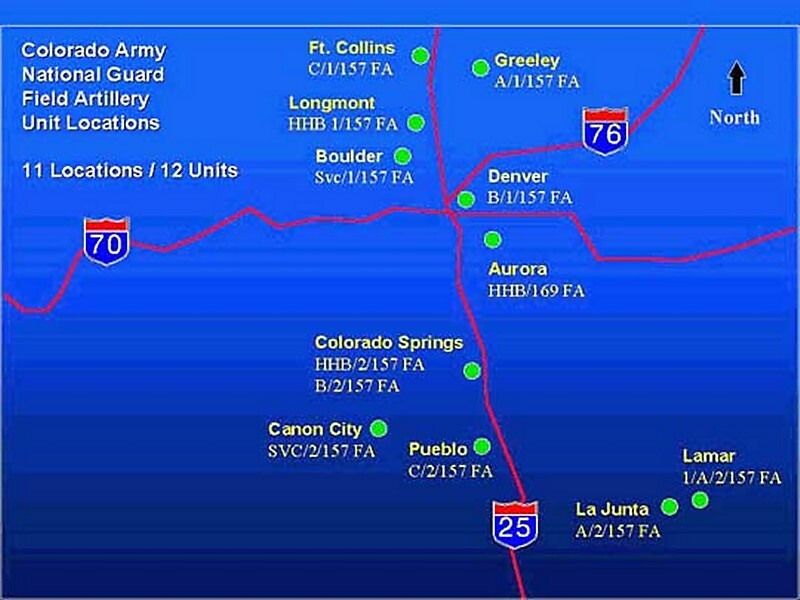 In FY99 the Colorado Army National Guard supported approximately 234 counterdrug missions on behalf of the Joint Support Office. In addition to spotting a downed aircraft near Pagosa Springs, aviation assets assisted in various Search and Rescue missions including the rescue of hunters in Summit and Eagle Counties and a downed aircraft at Wolf Creek Pass. COARNG units were also called up for state contingencies in support of flood victims in La Junta. COARNG units assisted local law enforcement agencies at the Columbine High School crime scene in April. Over 100 soldiers were involved, including members from the 220th Military Police Company and the 89th Troop Command and Aviation. In June, the state Public Affairs office coordinated a Public Affairs Airlift in conjunction with COARNG annual training at Camp Guernsey, Wyoming. The airlift enabled employers of COARNG members, civic leaders and media representatives to observe the training of COARNG units. Participants visited with the Adjutants General of Wyoming and Colorado and met with a Slovenian contingency participating in our "Partnership for Peace" alliance. In September the 220th Military Police Company began a 270-day deployment to Hungary in support of Operation Joint Forge.